Examining ConfigMgrPrereq.log showed that there was collection mismatch dependency for the “Application Catalog” collection. 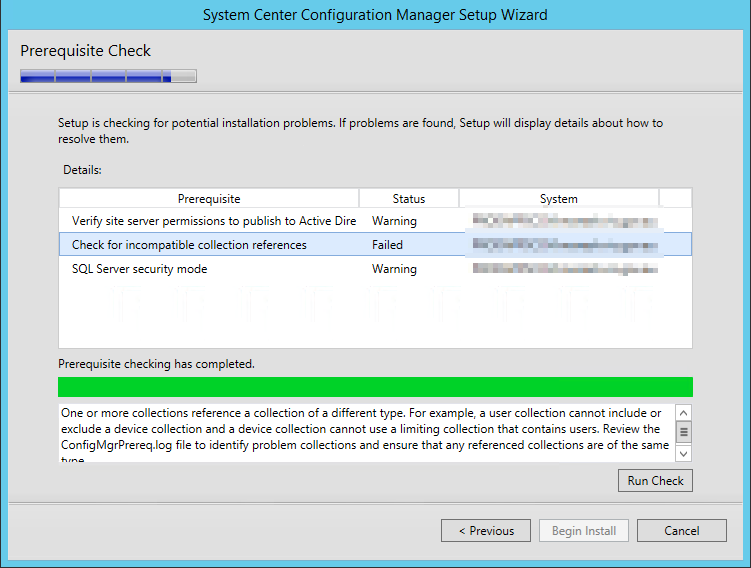 Reviewing this user collection in the ConfigMgr console showed that it had the All Systems collection (which is a device collection) as the limiting collection. So this mismatch in collection types was causing the issue and I suspect this had been created via an incorrectly configured PowerShell script. Fortunately the fix was simple and after changing the limiting collection to All Users, the error disappeared from the prerequisite check and the upgrade completed successfully!